You can check out updates on the following hashtags on Twitter: #GAAD and #GAAD2017. You can also use them to share you own stories on how you help raise accessibility awareness today. See also the Global Accessibility Awareness Day Twitter account , and the list of events worldwide (including online event). For Hebrew speakers, I can share that there will be a free webinar in Hebrew that will take place at 12:00PM (Israel Time). 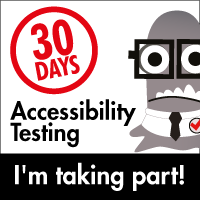 I also want to take the opportunity to introduce the 30 Days of Accessibility Testing that is happening all this month. A great initiative by the Ministry of Testing software testing community. You are invited to take the daily challenges and check out #30DaysOfTesting on Twitter to find great resources people shared so far.